Coexistence between trees and grasses in savannas is generally assumed to be due to a combination of partial niche separation for water acquisition and disturbances impacting the demography of trees and grasses. We propose a mechanism of coexistence solely based on the partitioning of the two dominant forms of mineral nitrogen (N), ammonium (NH4+) and nitrate (NO3−). 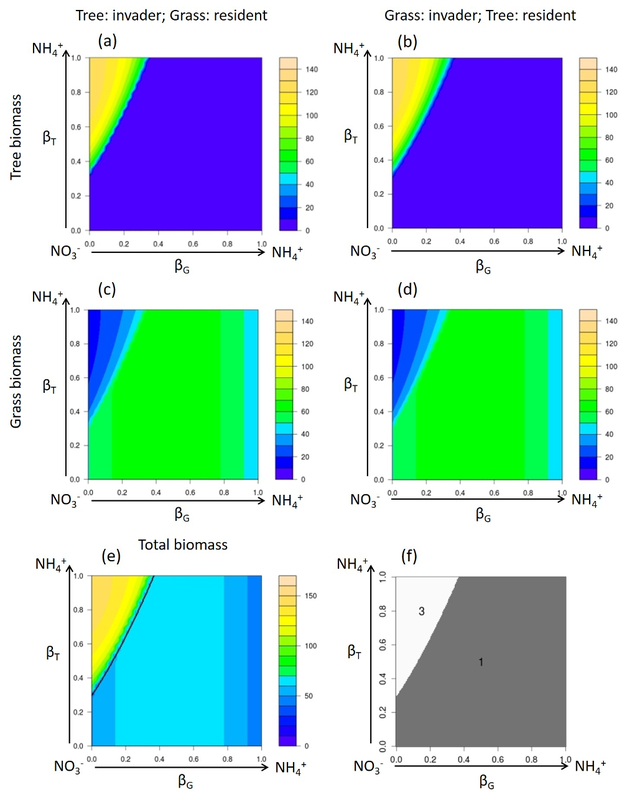 We built a mean-field model taking into account the capacity of grasses and trees to alter nitrification fluxes as well as their relative preferences for NH4+ versus NO3−. Two models were studied and parameterized for the Lamto savanna (Côte d’Ivoire): In the first model, the nitrification only depends on the quantity of available NH4+, and in the second model the nitrification rate is also controlled by tree and grass biomass. 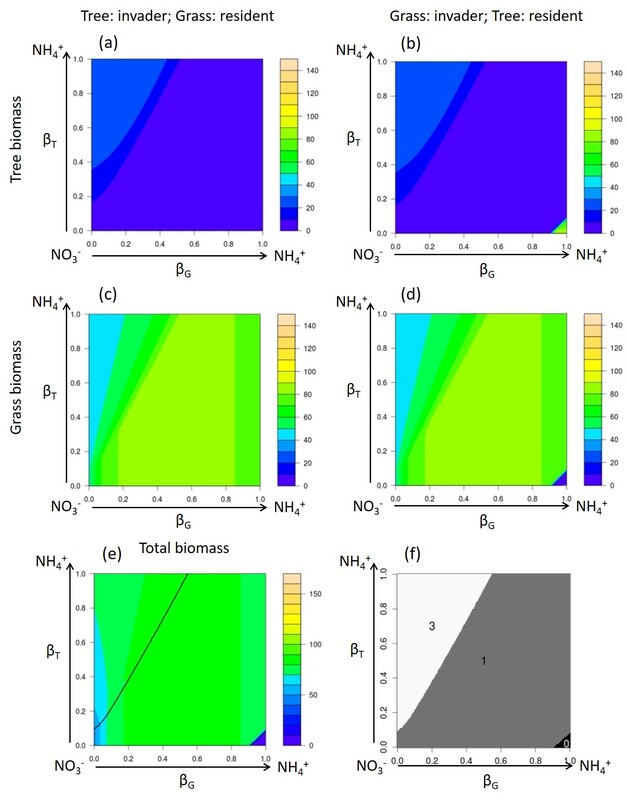 Consistent with coexistence theories, our results show that taking these two forms of mineral N into account can allow coexistence when trees and grasses have contrasting preferences for NH4+ and NO3−. Moreover, coexistence is more likely to occur for intermediate nitrification rates. Assuming that grasses are able to inhibit nitrification while trees can stimulate it, as observed in the Lamto savanna, the most likely case of coexistence would be when grasses prefer NH4+ and trees NO3−. 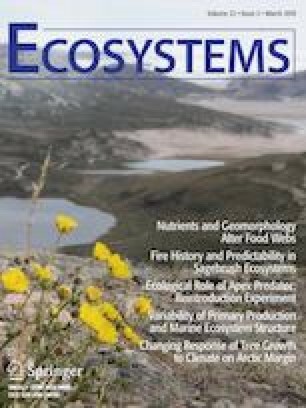 We propose that mineral N partitioning is a stabilizing coexistence mechanism that occurs in interaction with already described mechanisms based on disturbances by fire and herbivores. This mechanism is likely relevant in many N-limited African savannas with vegetation composition similar to the one at the Lamto site, but should be thoroughly tested through empirical studies and new models taking into account spatiotemporal heterogeneity in nitrification rates. SK, JG, JCL, SB and XR conceived or designed study and performed research. SK analyzed the model and wrote the manuscript with the contribution of all co-authors. All authors gave final approval for publication. The online version of this article ( https://doi.org/10.1007/s10021-019-00365-x) contains supplementary material, which is available to authorized users. We thank the Ministry of Higher Education and Scientific Research of Côte d’Ivoire for the PhD grant of SK. This paper is dedicated to the memory of A. Konaré (1965-2017), director general of scientific research and innovation of Côte d’Ivoire.